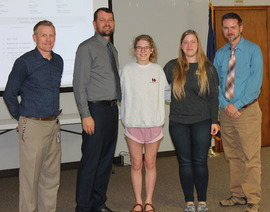 The USD 320 Board of Education recognized two students from the high school that participated in state Honor Bank and Honor Choir. 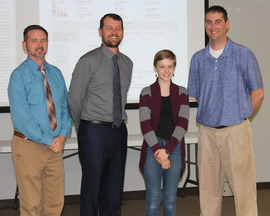 Kylee Gardner was selected to the Kansas Music Educator's Association State 1-4A Honor Band for the third year in a row. She is only the second student that has done that since I have been here in Wamego. 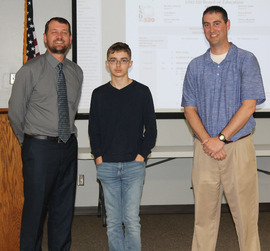 Students become eligible to audition for the State Band when they are sophomores and it is quite an accomplishment to make it three years in a row. Kylee has been first or second chair each year that she's been selected and the band only takes 8 French Horns out of all possible French Horn players throughout the state. The Honor Band met in Wichita February 21st-23rd. Congratulations to Beth Land for being selected to the Inaugural All-State Treble Choir. Beth was selected to sing in a choir of 168 female voices out of auditions done all across the state of Kansas. Beth Traveled to Wichita, Kansas to rehearse two days with a guest clinician and then performed at Century II Convention Hall with all the State ensembles. 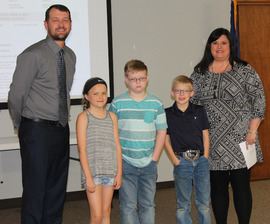 The following students were recognized at the Board of Education meeting Monday April, 8th. 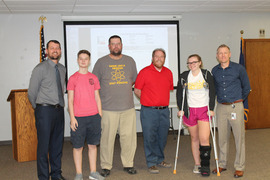 Out of 202 of the best and brightest student researchers and inventors from across the state of Kansas, Wamego brought home a Gold and two Silvers (1st and two 2nd's). C.J. Hartley's (not pictured) project was "Ion Engine" in which he built a scale-model replica of an ion-drive engine as used on deep space probes, and tested its thrust capabilities. This research earned him a Silver (2nd place). Isabella Budreau's (not pictured) project was to build a shape-drawing robot from scratch. Her creation earned her a Silver (2nd place). 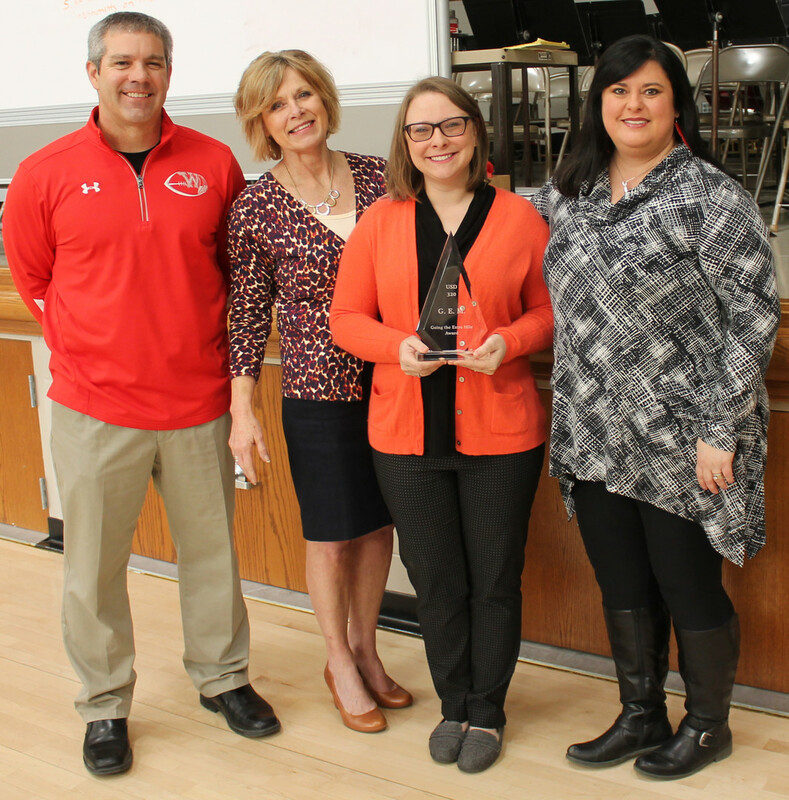 Nadine Reifschneider (pictured) was recognized for the hours and hours of time dedicated to helping with the science fair. The Science Fair could not have been executed as smoothly as it was had it not been for Nadine's assistance! Congratulations to Pyper Paddock(not pictured) and Josephine Benson for both being selected to the John Philip Sousa Honor Band that took place in Lawrence on January 18th and 19th. Both girls performed a very difficult audition for this event which is open to all 7th grade through 9th grade band members throughout the whole state. It is an incredible honor to be selected for this group--the group consists mainly of HS students from the Lawrence and Kansas City area. 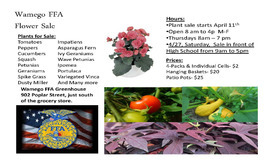 The Wamego FFA Flower sale begins April 11th at 3:30, at the greenhouse behind the high school. 1. Do you have any perennials or landscaping plants? A- We only grow annuals and do not have any landscaping plants or trees. 2. Are these plants safe to put outside now? A- Our greenhouse is set to drop to 38degrees at night. If it would get colder than that outside they might freeze. 3. Do you save or let people hold an order? A-We do not save back any plants for customers. A-We only accept cash or checks. 5. Where do we park at? A- park on the south side of the greenhouse to the west of the shop building. 6. Does the school get the money? A- No, The Wamego FFA uses the money to pay for competitions and leadership events. 7. Can we return plants with issues? A- All sales are final and we do not accept any returns. 8. What do you have for selection? 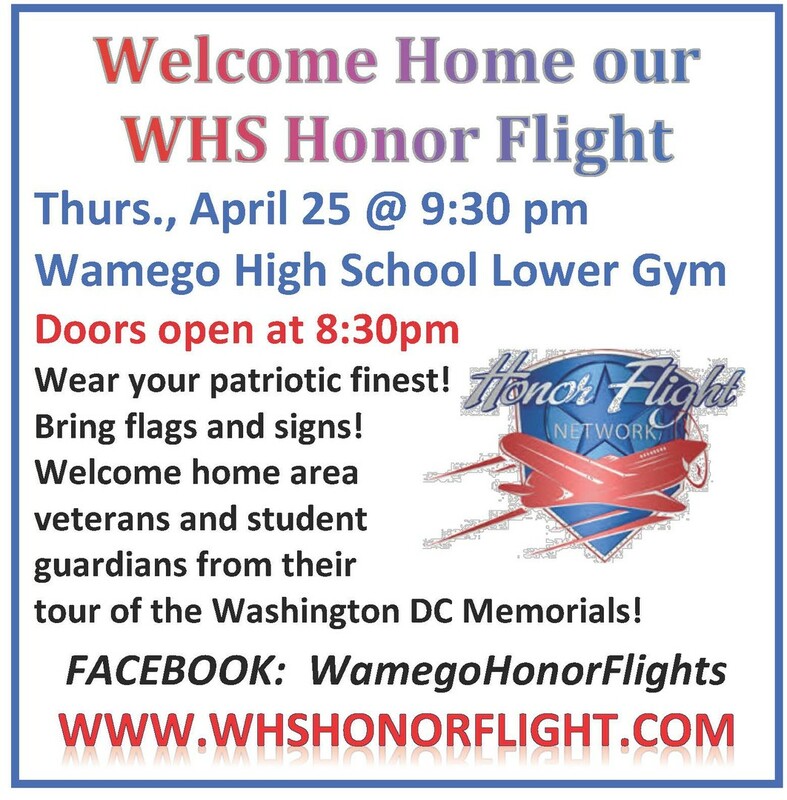 A-Check out the flyer attached or swing by! 9. Are you open on the weekend? A-the only weekend we will be open at this time is Saturday April 27th. 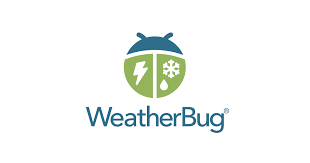 IF the weather is not good on the 27th we will be open on the 28th. Congratulations to Abby Ross, Title 1 Teacher at West Elementary, April’s G.E.M. Award recipient. I’d like to nominate Mrs. Abby Ross for the USD 320 Gem Award. Mrs. Ross is a Title 1 teacher at West Elementary. She definitely goes the extra mile for the students and staff alike. Her upbeat personality is contagious! It is really hard to have a bad day when Mrs. Ross is around. She is everyone’s cheerleader. Her positivity encourages her students to be the best they can be. She has high standards, and her students rise to her expectations. They know she wants what is best for them. Mrs. Ross builds relationships with all of our students at West Elementary by consistently greeting them in the hallways, at breakfast, and outside after school. She spends one on one time with students in need. They are open with her because they trust her. She also lends a listening ear to all staff and offers assistance to anyone in need by sharing materials, giving instructional advice, or just giving a boost in spirit! By putting in countless hours learning new technologies and assessments, she not only helps her students build their reading skills, but she also efficiently measures their progress. She is very effective in sharing her instructional and assessment knowledge with staff. She is responsible for coordinating the testing for the whole school and puts together the reading assessment materials for every grade level. Mrs. Ross’s presence around the school makes everyone feel good about being here. She is warm and accepting to everyone she meets. These reasons, and many more, are why I believe she deserves the GEM award. Thank you for your consideration. “It makes me smile to see children leaning over a table, dig into a book, solve problems, and construct meaning. These precious children are becoming lifelong readers and experiencing the excitement of getting lost in a book”. This quote is a true statement for Reading Specialist, Abby Ross. On a daily basis, Abby goes above and beyond her expected duties to make West Elementary a safe, warm, and inviting place for all students and staff. Abby’s dedication to literacy and reading instruction is evident; she spends not only school time, but personal time preparing lessons that are interesting and engaging for students. She creates lessons for all grade levels at West Elementary and is strategic at reading and keeping up on the latest research and best practices for students. With her passion for teaching, enthusiasm, and the joy she brings each day instills the love of reading with her students. Abby’s heart is with not only the students she teaches, but with students she has taught in the past. She stays current with how all her students are reading, both present and past, and is in constant contact with the classroom teachers. She has a unique talent to build personal relationships with her students. Her students feel “at home” in her classroom and know they will get positive feedback from her as they give their best efforts. Abby also prepares and coordinates all the testing for the whole school and is in constant communication with classroom teachers on how to implement the tests. She puts in countless hours learning new technologies and assessments that will efficiently measure the student’s progress and determine how to improve her instruction on how to best meet the needs of her students. She is always willing to share her instructional knowledge with fellow teachers and also have a conversation on how to change instruction so each student is having success as a reader and a writer. Abby sets an example of what an educator should be: a team player, positivity, enthusiasm, and unconditional love that impacts and makes a difference in students’ lives. Her passion for teaching is contagious, her joy she shows to all of her students, and her upbeat attitude personify what a teacher should be. USD 320 is a better place because of Abby. These and many more reasons are why I am honored to nominate Abby Ross as a true definition of what a GEM is and should be.